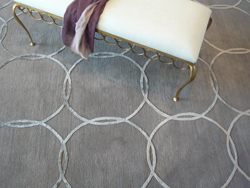 Riviere create custom hand made rugs of exceptional quality, our designs reflecting a passion for understated elegance and timeless glamour. Using the finest grade Tibetan wool and pure Chinese silk, rugs are entirely hand woven in our Nepal workshop using a minimum of 100 knots per inch. Size, shape, colour and texture can all be specified. We work exclusively with interior designers and architects on prestigious projects in the UK and abroad and in addition to our own collection, we also offer a fully bespoke service. Each of our rugs is unique, combining outstanding craftsmanship, creativity and quality to produce a piece that is original, beautiful and long lasting.